Richard Deth, Ph.D., is a Professor of Pharmacology in the Department of Pharmaceutical Sciences, College of Pharmacy. Dr. Deth received his Ph.D. from the University of Miami in 1976 and joinedNova Southeastern University in the Fall of 2014, after serving as a faculty member at Northeastern University in Boston for 38 years. During his tenure at Northeastern he served as Chairman of the Department of Pharmaceutical Sciences and Director of the Pharmacy Program. He has published more than 100 research articles and book chapters and a monograph. During his more than four decades of academic research experience, Dr. Deth has extensively investigated molecular mechanisms underlying cellular regulation, including an ongoing interest in neurotransmitter receptor signaling pathways. In 1998 his detailed understanding of conformational changes in G protein-coupled receptors induced by binding of neurotransmitters such as epinephrine, enabled Dr. Deth to discover a novel signaling activity of the D4 dopamine receptor. This unique phospholipid methylation activity allows the D4 receptor to modify the physical environment of its surrounding membrane in response to dopamine, affecting synaptic activity and modulating neuronal firing. As outlined in his 2003 monograph “Molecular Origins of Human Attention: The Dopamine-Folate Connection”, this novel D4 receptor signaling mechanism changes the frequency of neural networks in a manner that produces attention. Subsequent investigations revealed that a number of environmental toxins, each of which lowers antioxidant levels, potently interfere with D4 dopamine receptor methylation activity, providing a metabolic link to neurodevelopmental disorders such as attention-deficit hyperactivity disorder (ADHD) and autism. The micronutrients vitamin B12 and folic acid provide crucial support for the methylation process, and in 2016 Dr. Deth published a landmark study showing that brain levels of vitamin B12 decrease more than 10-fold across the lifespan, and the decrease is especially prominent after 50 years of age. Importantly, brain vitamin B12 levels were prematurely decreased in both autistic subjects and subjects suffering from schizophrenia. Dr. Deth has been extensively involved with several parent/practitioner-based autism organizations, including the National Autism Association and the Autism Research Center. These and other observations lay the groundwork for recognizing the fundamental role of oxidative stress and impaired methylation in a number of brain disorders, opening the way to novel metabolic treatment approaches, some of which are already showing promise in clinical trials. As described below, the B.R.A.I.N. Centerat NSU aims to be a leader in advancing the research and treatment opportunities emanating from this emerging perspective. Co-director: Malav S. Trivedi, Ph.D.
Malav S. Trivedi, Ph.D., is an Assistant Professor of Pharmacology in the Department of Pharmaceutical Sciences, College of Pharmacy. Dr. Trivedi joined Nova Southeastern University in the Fall of 2015 after completing his Doctoral and Post-Doctoral research in Neuropharmacology at Northeastern University. “You are what you eat.” Dr. Trivedi’s research is focused on investigating the effects of nutrition and dietary peptides on cognitive and gastrointestinal health. He has investigated molecular mechanisms underlying the effects of several food-derived peptides on cellular functions, especially on the brain and the gastrointestinal tract. This research has improved our understanding of the benefits of gluten- and casein-free dietary interventions in autistic and schizophrenic patients. Of particular local interest, Broward County and Miami Dade County in Florida are rated highest in opioid drug addiction. Dr. Trivedi’s preliminary research identifies the combined effects of an individual’s genes as well as the environmental exposure. This is a unique approach in understanding molecular mechanisms underlying drug addiction. Such research indicates that current treatment approaches might be benefited by supporting the metabolic imbalances especially in relation to antioxidant status in affected drug addicts. Dr. Trivedi has extensive experience in monitoring and coordinating preclinical and clinical research focusing on dietary interventions. Collaborators include the Food and Behavior group at Oxford University, the Liggins Center in New Zealand and the Chinese Military Academy in Shanghai. Dr. Trivedi has had successful grant funding, contracts, and has peer-review publications in the field of neurometabolism. Lynn Lafferty, Pharm.D., is a doctor of Pharmacy and licensed pharmacist, naturopath, herbalist, nutritionist and chef who is committed to finding the safest and most effective means to promote health and wellness over disease and illness. She is an Assistant Professor in the Integrative Medicine Department at Nova Southeastern University College of Osteopathic Medicine and Faculty in the M.S. Nutrition Program. She is Director of the Functional Clinical Nutrition and Herbal Medicine practice in the Nova Southeastern University Clinic Pharmacy, and created a certificate program for Medical and Osteopathic Doctors, Pharmacists, Dentists, and other licensed health care practitioners within the M.S. Nutrition program. She is proud to serve on the boards of the American Academy of Environmental Medicine, Broward County Pharmacy Association, and commissioner on the Broward County Substance Abuse Task Force. Her research is focused on natural medicine and supplementation therapy and is currently conducting research on Antibiotic Resistance and Natural Immune Builders, Herbal considerations in the elderly populations, discrimination of patients, and genomics. Dr. Lafferty is a nationally renowned speaker on the topics of Food as Medicine, Genomics, Nutrigenomics, Natural Immune Builders, Meditation, Herbal Therapy and functional nutrition. Her goal is to educate and help as many people as possible to the many possibilities of combining the best of both worlds from modern medicine and age old traditional therapies. Associate: Ana M. Castejon, Ph.D.
Anna M. Castejon, Pharm.D., is an Associate Professor of Pharmaceutical Sciences at NSU, where she serves as Co-Chair of the Department and teaches pharmacology-related content to PharmD students as well as graduate program courses. Dr. Castejon is a pharmacist and a pharmacologist with basic and clinical research expertise in a range of fields from cardiovascular to autism spectrum disorders. Recently, Dr. Castejon led the first investigator-initiated clinical trial conducted at NSU. This multidisciplinary study investigated the role of a nutritional supplement in increasing antioxidant capacity in autistic subjects and its impact in core areas of autism behavior. She is currently leading research projects investigating the neuroprotective role of oxytocin in brain cells, and novel cell death mechanisms in autism using repository cell lines isolated from neuro-typical and autistic individuals. Lubov Nathanson, Ph.D., received her Ph.D. in Molecular Biology and Biochemistry from the Weizmann Center of Science, Israel. Her postdoctoral work at the University of Miami allowed her to gain a better understanding of cellular processes. As Manager and later Director of the Gene Expression and Microarray Core (2004-2010), she gained extensive hands-on experience of sample processing for microarray, Nanostring and NextGen sequencing analyses. As part of the Bioinformatics group (2010-2012) she used and evaluated many different bioinformatics software tools while gaining experience in analyzing large genomics datasets as well as conducting systems biology analyses, with additional expertise in bioinformatics, molecular biology, biochemistry and systems biology. Much of Dr. Nathanson’s academic work in recent years has involved analyses of gene expression data from Nanostring, microarrays and RNA-seq. In 2012, Dr. Nathanson joined NSU as an Assistant Professor, which allowed her to lead her own research studies. She is a member of NSU’s Institute for NeuroImmune Medicine (INIM), where her work is focused on neuroinflammatory and neurodegenerative disorders such as chronic fatigue syndrome, Gulf War Illness, Parkinson’s disease, and multiple sclerosis using the newest proteomic, genomic, and computational techniques. Marian Lemle serves as project development consultant for the B.R.A.I.N. Center. Early in her career, she worked in policy planning and development at the White House Office of Telecommunications Policy and has served on four non-profit educational boards. 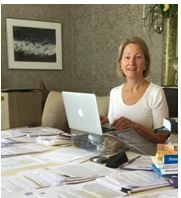 When her daughter suddenly became ill with CFS/ME more than a decade ago, Marian began a systematic study of the literature and developed innovative concepts about the nature of the illness. This led to the development of the “hibernation” theory of illness in CFS/ME, representing the first comprehensive theory of hydrogen sulfide in chronic illness. Marian received a B.A. from Antioch College and an M.B.A. from the Wharton School of Business, University of Pennsylvania.